Earth is a truly unique in its abundance of water. Water is necessary to sustaining life on Earth, and helps tie together the Earth's lands, oceans, and atmosphere into an integrated system. Precipitation, evaporation, freezing and melting and condensation are all part of the hydrological cycle - a never-ending global process of water circulation from clouds to land, to the ocean, and back to the clouds. This cycling of water is intimately linked with energy exchanges among the atmosphere, ocean, and land that determine the Earth's climate and cause much of natural climate variability. The impacts of climate change and variability on the quality of human life occur primarily through changes in the water cycle. As stated in the National Research Council's report on Research Pathways for the Next Decade (NRC, 1999): "Water is at the heart of both the causes and effects of climate change." The ocean plays a key role in this vital cycle of water. The ocean holds 97% of the total water on the planet; 78% of global precipitation occurs over the ocean, and it is the source of 86% of global evaporation. Besides affecting the amount of atmospheric water vapor and hence rainfall, evaporation from the sea surface is important in the movement of heat in the climate system. Water evaporates from the surface of the ocean, mostly in warm, cloud-free subtropical seas. This cools the surface of the ocean, and the large amount of heat absorbed the ocean partially buffers the greenhouse effect from increasing carbon dioxide and other gases. Water vapor carried by the atmosphere condenses as clouds and falls as rain, mostly in the ITCZ, far from where it evaporated, Condensing water vapor releases latent heat and this drives much of the the atmospheric circulation in the tropics. This latent heat release is an important part of the Earth’s heat balance, and it couples the planet’s energy and water cycles. 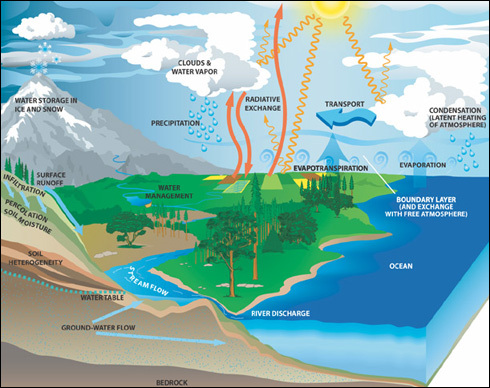 The major physical components of the global water cycle include the evaporation from the ocean and land surfaces, the transport of water vapor by the atmosphere, precipitation onto the ocean and land surfaces, the net atmospheric transport of water from land areas to ocean, and the return flow of fresh water from the land back into the ocean. The additional components of oceanic water transport are few, including the mixing of fresh water through the oceanic boundary layer, transport by ocean currents, and sea ice processes. On land the situation is considerably more complex, and includes the deposition of rain and snow on land; water flow in runoff; infiltration of water into the soil and groundwater; storage of water in soil, lakes and streams, and groundwater; polar and glacial ice; and use of water in vegetation and human activities. Illustration of the water cycle showing the ocean, land, mountains, and rivers returning to the ocean. Processes labeled include: precipitation, condensation, evaporation, evaportranspiration (from tree into atmosphere), radiative exchange, surface runoff, ground water and stream flow, infiltration, percolation and soil moisture. The hydrologic cycle describes the pilgrimage of water as water molecules make their way from the Earth's surface to the atmosphere, and back again. This gigantic system, powered by energy from the sun, is a continuous exchange of moisture between the oceans, the atmosphere, and the land. Credit: NASA GSFC Water and Energy Cycle web site. 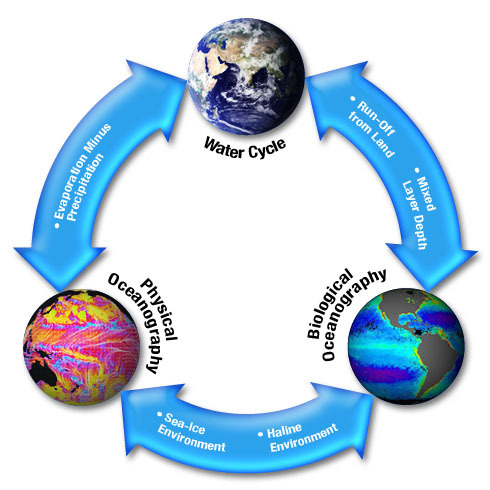 This diagram show the relationship between Physical Oceanography, Biological Oceanography, and Water Cycle. Feedbacks between Physical Oceanography and Water Cycle are Evaporation minus Precipitation and Fresh water transports (i.e. Goldsborough Circulation). Biological in the ocean is affected by the water cycle via the Mixed Layer Depth and Run off from land. Finally, feedback between Physical and Biological Oceanography include the sea-ice and haline enivironments. Evaporation ("E") controls the loss of fresh water and precipitation ("P") governs most of the gain of fresh water. Scientists monitor the relationship between these two primary processes in the oceans. Inputs from rivers and melting ice can also contribute to fresh water gains. Evaporation minus precipitation is usually referred to as the net flux of fresh water or the total fresh water in or out of the oceans. E-P determines surface salinity of the ocean, which helps determine the stability of the water column. Salinity and temperature determine the density of ocean water, and density influences the circulation. E-P determines surface salinity of the ocean, which helps determine the stability of the water column. Precipitation also affects the height of the ocean surface indirectly via salinity and density. At the surface of the ocean, mixing by the wind can change the density to the point where the temperature and salinity are constant throughout the mixed layer. The depth of the mixed layer is called the mixed layer depth. Phytoplankton in the ocean can impact this mixed layer depth by absorbing the sun's heat at the surface thus decreasing the amount of sunlight that reaches deeper water. In effect, the phytoplankton causes the heating to be confined to a thin layer near the surface and reduces the thickness of the mixed layer. The ocean surface is constantly being stirred up by wind and changes in density or buoyancy. The ocean naturally has different physical characteristics with depth. As depth increases, temperature decreases because the sun only heats surface waters. Warm water is lighter or more buoyant than cold water, so the warm surface water stays near the surface. However, surface water is also subject to evaporation. When seawater evaporates, water is removed, salt remains, and relatively salty water is left behind. This relatively salty water can float at the surface; for example, in the tropics it floats because is it so warm and buoyant. At higher latitudes, sea water tends to be salty because of poleward transport of tropical water and to a lesser extent, sea ice formation. When sea ice forms, the salt is not crystallized in the ice, leaving the remaining waters relatively salty. Also, near the poles, the seawater is cold and dense. The interaction between water temperature and salinity effects density and density determines thermohaline circulation, or the global conveyor belt. The global conveyor belt is a global-scale circulation process that occurs over a century-long time scale. Water sinks in the North Atlantic, traveling south around Africa, rising in the Indian Ocean or further on in the Pacific, then returning toward the Atlantic on the surface only to sink again in the North Atlantic starting the cycle again. 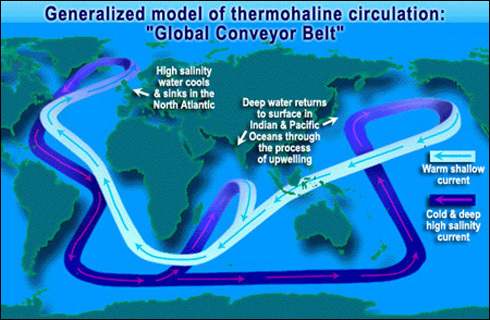 Generalized model of the thermohaline circulation: 'Global Conveyor Belt' This illustration shows cold deep high salinity currents circulating from the north Atlantic Ocean to the southern Atlantic Ocean and east to the Indian Ocean. Deep water returns to the surface in the Indian and Pacific Oceans through the process of upwelling. The warm shallow current then returns west past the Indian Ocean, round South Africa and up to the North Atlantic where the water becomes saltier and colder and sinks starting the process all over again. As water travels through the water cycle, some water will become part of The Global Conveyer Belt and can take up to 1,000 years to complete this global circuit. It represents in a simple way how ocean currents carry warm surface waters from the equator toward the poles and moderate global climate. To track changes in SSS patterns over time, scientists monitor the relationship between evaporation and precipitation in the oceans. After the launch of Aquarius in 2008, scientists will be able to produce accurate maps of global (E - P). Thus, for the first time we will observe how the ocean responds to variability in the water cycle, from season-to-season and year-to-year. NASA's Aqua mission contributions to monitoring water in the Earth's environment will involve all six of Aqua's instruments: the Atmospheric Infrared Sounder (AIRS), the Advanced Microwave Sounding Unit (AMSU), the Humidity Sounder for Brazil (HSB), the Advanced Microwave Scanning Radiometer-Earth Observing System (AMSR-E), the Moderate Resolution Imaging Spectroradiometer (MODIS), and Clouds and the Earth's Radiant Energy System (CERES). The AIRS/AMSU/HSB combination will provide more-accurate space-based measurements of atmospheric temperature and water vapor than have ever been obtained before, with the highest vertical resolution to date as well. Since water vapor is the Earth's primary greenhouse gas and contributes significantly to uncertainties in projections of future global warming, it is critical to understand how it varies in the Earth system. Frozen water in the oceans, in the form of sea ice, will be examined with both AMSR-E and MODIS data, the former allowing routine monitoring of sea ice at a coarse resolution and the latter providing greater spatial resolution but only under cloud-free conditions. Sea ice can insulate the underlying liquid water against heat loss to the often frigid overlying polar atmosphere and also reflects sunlight that would otherwise be available to warm the ocean. AMSR-E measurements will allow the routine derivation of sea ice concentrations in both polar regions, through taking advantage of the marked contrast in microwave emissions of sea ice and liquid water. This will continue, with improved resolution and accuracy, a 22-year satellite record of changes in the extent of polar ice. MODIS, with its finer resolution, will permit the identification of individual ice floes, when unobscured by clouds.